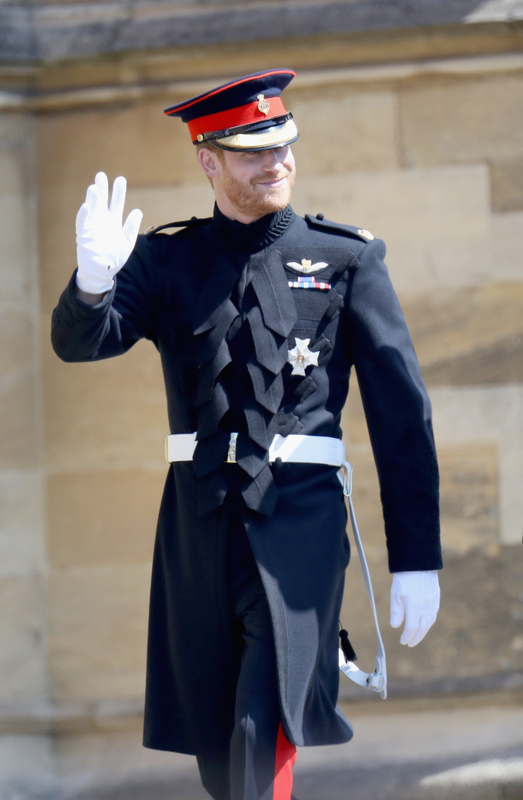 The Duke of Sussex's wedding outfit was the frockcoat uniform of the Household Cavalry (the 'Blues and Royals'), made by tailors at Dege & Skinner on Savile Row. As the uniform specially commissioned for the occasion is required for use by His Royal Highness, this is an identical uniform made for The Duke by Dege & Skinner a few years earlier. The uniform's single-breasted blue doeskin jacket has figured braiding of Regimental pattern on the stand-up collar and sleeves. It is ranked to Major with large gold embroidered crowns on the epaulettes. The trousers, officially called 'overalls', are made from a blue and black wool barathea and are fastened by a leather strap and buckle underneath the boot.